How Much Exercise Does Your Puppy Really Need? 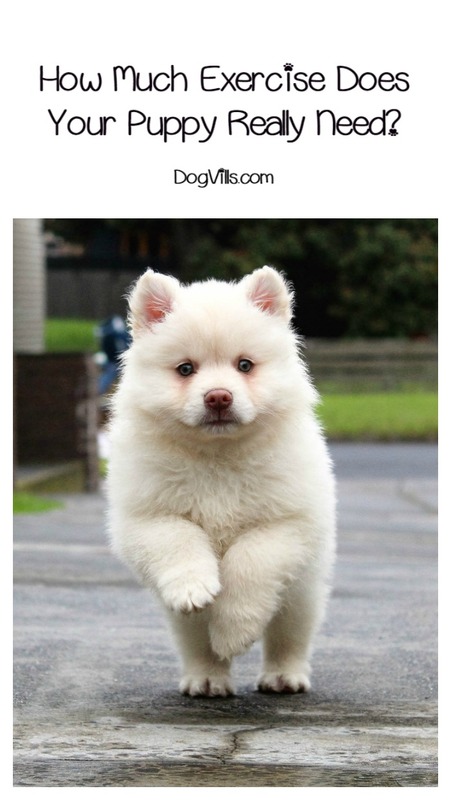 It’s no secret that puppies are full of boundless energy, enthusiasm and love to give. But did you know that as important as exercise is for us to feel good and to be as healthy as possible, it’s also incredibly important for your pup as well? But when it comes to encouraging your pooch to be active, just how much exercise does your puppy really need? Let’s talk about a few guidelines for determining the right amount for your pup! As a basic rule of thumb, puppies need about five minutes of exercise per month of their age about twice a day. For example, if your little ball of fur is only two months old (so cute! ), then Fido should get about ten minutes of exercise twice a day. The amount of time that your puppy needs exercise-wise increases as your pup ages, and should plateau at about a year of age. You can take your puppy for a walk; play fetch with a ball in the backyard (just don’t expect your pup to bring the ball back just yet! ); chase each others; etc. Remember not to overdo it when your puppy is very young by keeping the rule of five minutes per month of age in mind. Now, that “rule of thumb” is just that, a vague rule that the majority of dog experts tend to agree with, but it isn’t written in stone. Caesar Milan has a different opinion. On his site, he talks about how most puppies will let you know when they’ve reached their limit. Learn the cues. If you’re racing around and your pup can’t keep up, it’s time to call it quits. On the other hand, if your pup is having a great time running around with you in the backyard, you don’t need to stop after ten minutes just because time is theoretically up. Of course, there are caveats to this. For example, if your vet recommends that your pup not overdo it for medical reasons or it’s blazing hot outside, you may have to call a “time out” before your pup is ready to stop the fun. Exercise is so important for your puppy’s overall health, just as it is for humans! Puppies who go for walks regularly and/or engage in play are less likely to develop arthritis later in life. Additionally, puppies who are kept active by their owners are less likely to become overweight, which can raise so many other health risks, such as: diabetes; joint, bone and ligament damage; increased risk of developing heart disease and high blood pressure; decreased stamina; lethargy; breathing difficulties; decreased immune function; skin and fur problems (eczema for example); increased risk of cancer; and an overall lower quality of life. Simply put, as much as exercise is important for humans, it’s equally as important for your puppy! Starting your puppy off at an early age with at least daily walks and exercise will ensure that your new pet is happy and healthy for life! Make sure to ask your veterinarian exactly how much exercise your dog should be getting a day. Certain breeds of dog can tolerate much more exercise daily than others, and it’s key to understand the unique activity level needs of your own puppy! Keeping a regular exercise routine is important for us, and it’s also the key to ensure that your puppy lives a long, healthy and happy life! How much exercise does your puppy get? Do you think it’s the right amount? Share your thoughts below!